Like everything else in my life these days I'm trying to redefine my social life. Usually when I get together with friends it is all about eating and for me that usually means eating all the wrong things and too much of them. So because of that I decided a few years ago to try and gather around activities instead of food. I call it Fit Social. I will say that it has not been an epic success as most would rather taste some goodness than sweat but I haven't given up on it. This past week a good friend of mine asked to get the kiddies together for a play date. 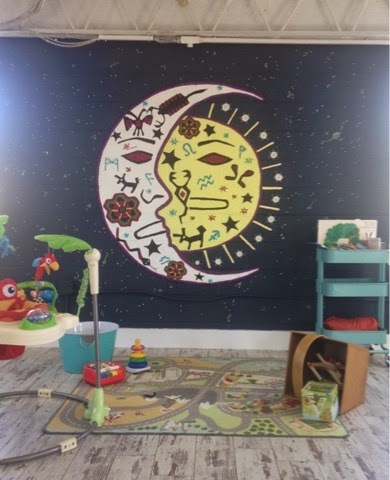 Her suggestion was Solstice Atlanta Urban Retreat for Moms. 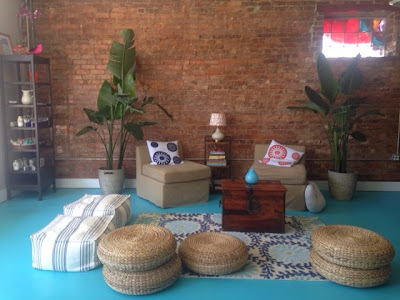 Urban Retreat for Moms? My interest was peaked and I felt special. I checked out their website and it was true. It was all about Mommy finding balance. Just what I needed. My Robin was going to be in Parents Morning Out, the day we scheduled to go, but that was ok with me. The play date was a no go because Mommy wanted to see this place that was catering to the needs of a Mother. As I told Kristen (one of the owners) we (me and the studio) were friends from the moment I walked in the door. Stepping inside you are greeted by a concrete turquoise floor that is practically glowing. What an entry and it sets the intention for the studio. To say that I adore turquoise would be an understatement. It reminds me of the of the sights and smells of the ocean in my island home. In fact, my toe toes were sporting the color. I immediately felt welcomed and comforted. Initially, when I decided to attend the class I thought I would be attending a Restorative Yoga session. I was good with that. Currently I am in training for the Callaway Gardens Duathlon and it calls for stretching two days per week and yoga fits the bill. However, after reviewing Solstice Atlanta's class schedule, I realized the class was going to be a Meditative Yoga session. I love yoga, but outside of a restorative yoga video I do about once every other week, I don't participate much because I have a condition called Hallux Rigidus. Simply put, it is a type of arthritis and bending and extra pressure for stabilizing causes serious pain. Being inexperienced I wanted to be sure I was setting myself up for pain later. While I waited for my friend to arrive, I discussed my unique situation with Kristen and Nicole (the instructor for the Meditative Yoga session) and they assured me that they were more than ready to provide modifications based on their clients needs. That was reassuring and immensely helpful during the session. It was a small, peaceful class that Nicole lead very confidently. I practiced with my eyes closed practically the entire time as she was very easy to follow and I didn't feel singled out for needing adjustments. We believe in the healing, therapeutic application of yoga and Pilates as well as preventative health. Safety and self acceptance are at the core of our approach. We strive to empower women and families by providing information and resources along with both emotional and tangible physical results in a safe community environment. And now for the big question. To be a true Mom retreat you want to know if they provide babysitting services, right. Yay, yes they do! They offer on site sitting services in a bright and cheery play space. I enjoyed seeing my friend and got to move my body which was very important to me. Mission Accomplished! How about you? Maybe your next meet up with your girls could be a Fit Social and possibly with Solstice Atlanta's Urban Retreat for Moms. It offers a close and trendy location, free and convenient parking, a welcoming environment, a great practice and excellent baby sitting services. It doesn't get too much better than that. ****I was not compensated for the post by Solstice Atlanta for this post in any way. All thoughts and opinions expressed here are my own. I've also been trying to schedule friend time around fitness instead of food - it can be challenging, but I also think it's good for friendships to move out of your comfort zone. I love the idea of the urban retreat. So true Ange. The retreat was awesome. I have quite a few "fitness" friends now and I love meeting up for run dates, group exercise dates rather than food. I need to get "fitness" friends. Thanks! I love the idea of meeting up with friends for fitness fun. We do that all the time it's a great way to avoid the unhealthy food and exercise. So true Deborah and I like to try new things on these fit socials. Love the idea of a fit social and that you haven't given up on it. I wish we had something like that here. Thanks Larisa. I have s few planned for this summer and hopefully they will Workout nicely. I have to move to Atlanta... Everything that I want to try seems to be there. This program looks fantastic! Come on over Jerusha. I love this city. This is such a neat idea. I love the way this place looked. I am starting to meet other fitness minded ladies in my area to meet up with also. Yeah the studio was really welcoming and comfortable. I need more fitness friends myself. that's awesome! I really like the idea of getting together around fitness activities instead of food. When it all comes together it is so much fun. That's sounds awesome!!! I would love to have a place like that near me. LaToya it is such a unique concept. What a great idea to combine friends and fitness. Love it! how cool! A company I work with started a social group called sweat-working, where people get together to go to fitness classes and sweat and "network" - it's such a great idea and so much better than drinks! Running friends are the best! The focus is almost always directly or indirectly on fitness. It is awesome to have like minded friends. I love the idea of getting together with friends for fitness related fun. So awesome that they had babysitting on site!!! Thanks so much for linking up! OH I love yoga and what a great way to catch up with friends!! I always try out new classes with my bff Christy, which is fun since we like different things! That place looks relaxing indeed! I bet a meditative yoga class is even more relaxing than a normal one...I would totally be interested in trying one!